Equipped with the latest 3-axis gyro sensors 3X is a flybarless system of Superlative. 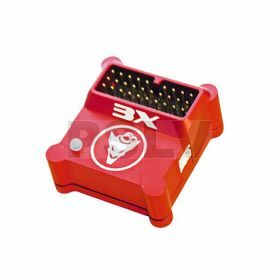 The extremely compact design with high quality Silicon MEMS gyros on gilded board and the enormous workload performance enables a gigantic flight performance and extreme 3D maneuvers. A must for all RC helicopter pilots who want to meet new challenges. The bavarianDEMON 3X is especially aimed at extreme 3D pilots, but also works X-tremely well for all other flybarless helis. Latest software algorythms, intelligent sensor technology combined with an unprecedented power, all this fitting the entire range of flybarless helicopters, electric, nitro, gaser and turbine powered. Because they are lighter, helicopter models without flybar are much more agile and manoeuvrable, and are approx. 15% more powerful. In combination with the bavarianDEMON 3X , huge performance is delivered, without the need to adjust the fragile flybar mechanism. Fascinating compatibility,Latest version of the sensors. The combination of the newest sensors with intelligent software algorithms not only delivers maximum per-formance of the flybarless system but also that of your RC helicopter. Helicopter models without flybar are much more agile and manoeuvrable compared to the 3X due to the ratio of weight to power which in turn re-sults in an increased performance of approx. 15% and a huge flight performance. In addition, the fragile flybar mechanism does not need to be adjusted. Programming is like child's play thanks to the intelligent bavarianDEMON set-up assistant. All necessary flight parameters can be optimised in flight because it is equipped with real-time tuning. For other configurations, the 3X can be connected to a PC or a notebook via a USB cable and all additional updates can be executed online. The connection cable from the receiver to the flybarless system can be inserted on both sides. Scope of delivery & gadgets,Compact. High quality. Impressive.